But not from teaching. I only have about 30 or so more years to go until I can do that! I'm talking about 5ks. 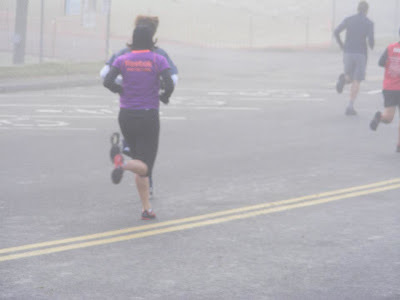 My first recorded 5k was over five years ago at Unity College and my finishing time was 31:08. 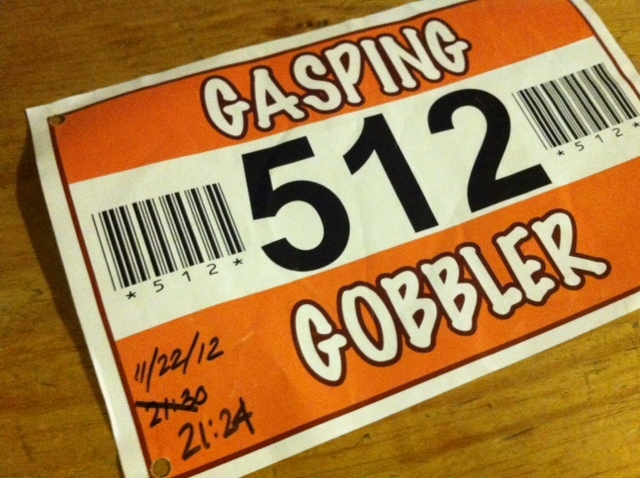 And last Thursday I ran my last (yeah right) 5k at the Gasping Gobbler with an official finishing time of 21:24. That's right. In 5.5 years, I've taken nearly 10 minutes off my 5k time. It's hard to believe where I started and where I am now. To be honest, I've made so much progress in the five years, it's hard for me to see that there is any more progress to make. Can I really ask for more? Last week I finally made the decision that I was going to run the Gasping Gobbler on Thanksgiving morning. This was the first Thanksgiving in a very long time that I wasn't hosting Thanksgiving Dinner at my house which meant I could actually run a race in the morning before heading off to my in-laws house for the day's festivities. But I kept wavering between running the 5k with my family and having a family run or if I was going to race it. 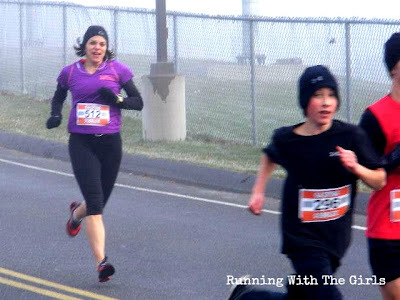 When we realized that there wasn't a family discount and that it would cost $66 for three of us to run it, we decided that it was going to be a race day for me. But of course, I had my own cheering section coming to the race to support me - only the best cheering section ever - Ward, Tucker & Izzy. Thursday morning started off quite chilly. 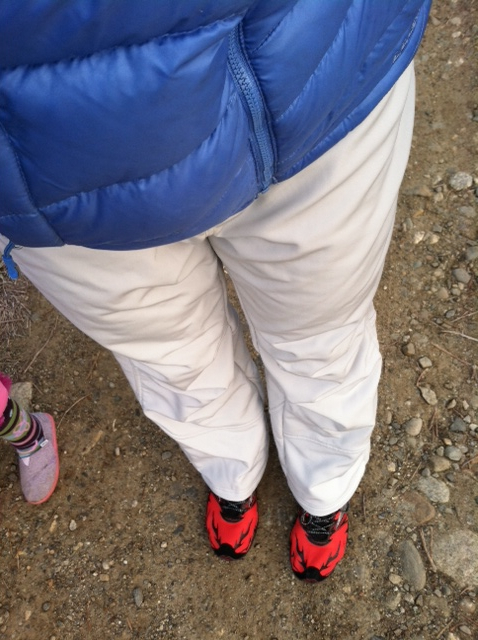 So chilly, I wore my LL Bean down jacket and ski pants to the race. I was tempted to run in them. But knew that it wasn't the best racing attire. Cozy yes. Not only was it chilly, it was foggy. 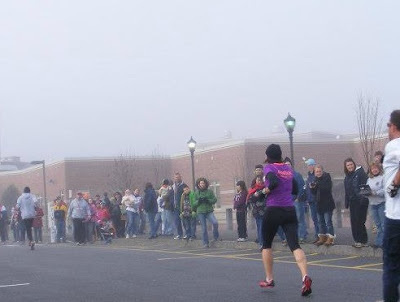 About 20 minutes prior to the start, I did a mile warm up. Peed one last time and then found my co-worker. We walked down to the starting line. She has done this race a few times before, so she was explaining the course to me. There was a small hill, down hill, and a lot of flat sections. Sounded great to me! We talked about our goal times and we were both hoping for low 22's. I decided that if I stayed with her, I'd be doing great. A few minutes later the race directors did their little explanation and before I knew it we were off. We did a little out and back to start off the race, which was awesome mostly because I got to see Ward and the kids two times and because it was mostly flat. I also got to see my friend Seth (aka Mizuno shoe junkie) and his son who came to cheer on the racers. When choosing my race outfit, I considered dressing for the holiday, but didn't have much in terms of brown, orange, or red. Only my red Mizuno Universe. So I turned to my lucky #GetAfterIt Reebok capris and Tufts10k shirt. My thought was that this racing outfit was good luck for the Tufts 10k, so why not. It was worth a shot. This is me, rocking it a little after mile 1. Feeling freaking awesome. 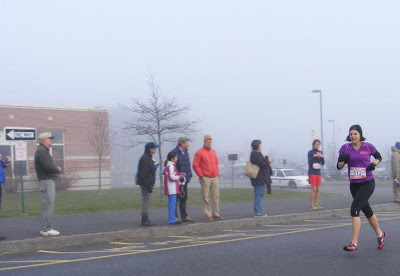 After I left them, the course did a little loop around the neighborhood, up a little hill, down a longer hill and then we were back at the high school. That was it. One of the things I love about 5ks is that they are over so fast, but then again, that's another thing I dislike about them as well. Here I am, coming in to the finish. My hat is popping off my head. Lovely. I would have taken it off a couple of miles back, but I didn't have anything else to keep my hair out of my face, so weird hat, popping off my head had to stay. I need to drop my shoulders - BIG time. I crossed the finish line feeling fantastic. And I did not let that guy there beat me. No way. It took me a few moments to remember to stop my Garmin, so I estimated my time at 21:30. Flipping Fantastic! That was a 40 second PR for me. I was beyond excited. Unfortunately, I couldn't stick around for long because Ward needed to fit in his run and we had to get to my in-laws house for Thanksgiving Dinner. I found out later on that I came in 2nd for my age group and won a pie. Darn. I hope the directors donated it. I also found out later on, when the official results were posted that my time was not 21:30, it was actually 21:24. I am beyond ecstatic with this time. That is incredible! So excited for you. No better feeling than a PR. Congratulations! That's an awesome pr, congrats!! I know what you mean about retiring from 5ks... they hurt! In the middle of each one, I promise myself it will be my last. :) Bummer you didn't stick around for the pie! That's an incredible time... 21 - WOW!! Nice work! AH-MAY-ZING!!! I'm hoping for a sub 25 in the next year...so I'm totally in awe! Wow, great time, congrats! 5ks are tough and that's an impressive time, I can see why you are considering retiring! That's an impressive improvement. Nice work! All I can say is that I hope someday to see a 5K time in the 20's. I've shaved off several minutes in the last year and I walked very little of the Turkey Day race, but still haven't managed to go sub-30. Very impressed. Bummer about missing out on your pie! Congrats on the incredible PR. Impressive, Jen....DAMN impressive! Well done, girl! Jen, that is awesome! Very impressive. I can't imagine shaving that much time off a 5K time in 5 years time. 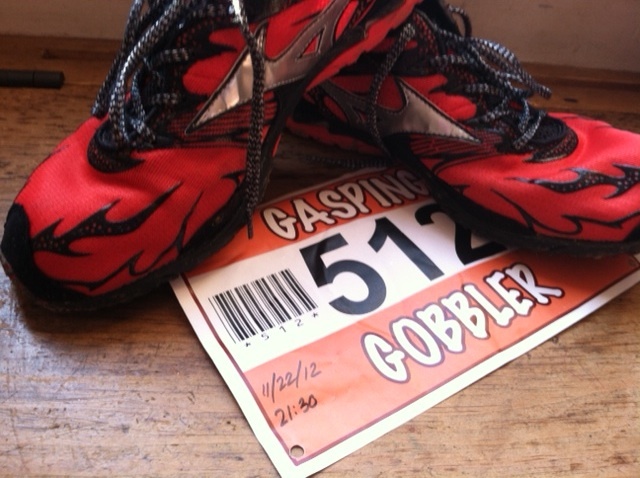 Maybe I can channel some of your speed and break 30 minutes for my 5K tomorrow! Awesome PR! That's an amazing 5k time. And I think I'm with you on the 5k. It's so nice that it's over so fast, but because it's over so fast you've got to run so fast. I still haven't made up my mind about that whole running fast thing. I'll stick with half marathons for right now.